Sit. Stay. Good blog. : Feel the burn! 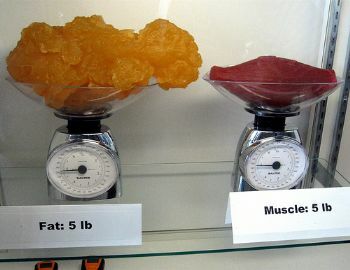 Looking at this, I finally understand what it means when people say that muscle weighs more than fat. I get it now, how one can gain weight while losing mass. Do you see? Do you get it? Does it click for you, too? This clicked so hard for me, that I joined a gym - the North Kansas City Community Center - in order to build more muscle, which in turn will help me burn more fat. Because, you see, I have decided to try something new. I've been fat - had a high body fat percentage - for as long as I can remember. Since childhood. I've never not been fat. So I've decided to try not being fat for a while and see how that goes. In order to give it a run, I've got to do some work in the form of weight training, cardio and all the rest. Speaking of cardio - I started Week 4 Day 1 of the Couch to 5K program yesterday. After a 5-minute warm-up walk, I ran for 3 minutes, walked for 90 seconds, ran for 5 minutes, walked for 3 minutes, ran for 3 minutes, walked for 90 seconds and ran for 5 more minutes before walking a cool down. For those keeping score, I ran a total of 16 minutes yesterday, a personal record! Sure, I'm not a speed demon at this point in my running career, but I'm not working on speed. I'm going for endurance. Once I can run for 30 minutes in a row, then I'll work on how far I run in that 30 minutes. All of this running and walking and weight training means we've been trying to put together quicker dinners lately. Luckily, it's summer so there's all sorts of fresh fruits and veggies out there to throw in the mix. Also, salmon sears up fast! Tonight we're having baked fish fillet sandwiches with leftover tabbouleh - I'm on a tabbouleh kick lately - before heading out to the gym for an upper-body workout. My arms are going to smart tomorrow, but I'll earn that pain. Remember - sweat is just fat crying. I love to watch it cry.